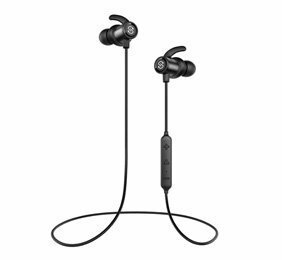 Comfortable, durable, functional what more could you ask for and at a reasonable price the SoundPEATS Q30's are a great value package for exercise gurus, joggers and casual users alike. Highly Recommended. Lightweight, perfect for sports and activities. Cable seems a little thin. Not as stylish as other brands. May be a little too sporty in appearance for some. Most of us use some form of digital entertainment nowadays, be it binge watching on Netflix or Spotify for listening pleasure. We tend to want to keep what we are listening to private. Phones and tablets are the norm nowadays for digital entertainment so trying to find a decent pair of earphones for personal use can become quite daunting. 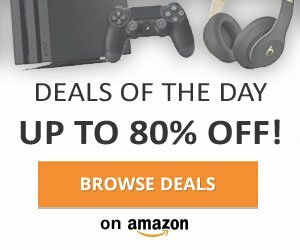 Wired, wireless, in-ear, over-ear, the choices today are astounding, most of us just want something we can pull out of a pocket or purse and wear with little hassle. Here is where the SoundPEATS Q30 are a simple but fully functional option that should seriously be considered. At first glance the earphones themselves are clearly geared to the more sporty of us out there. Equipped with IPX4 sweat proof technology, adjustable ear hooks, the list goes on. Even though this may be the case, don’t let these features put you off because you’ll soon find they are invaluable for even casual everyday use. Build quality overall seems sturdy, feeling durable in hand and did I forget to mention they are extremely lightweight. You won’t find any fiddly buttons on or around the individual earbuds as all of the controls are on the inline remote helping to keep everything as compact as possible. Included with the set is a customisable accessory pack that has everything you would need to make your experience with these earphones a comfortable and pleasurable one. Ear tips ranging from XS-XL are supplied along with various sized ear hooks to help keep them in-ear, making them ideal for jogging or a strenuous workout at the gym. 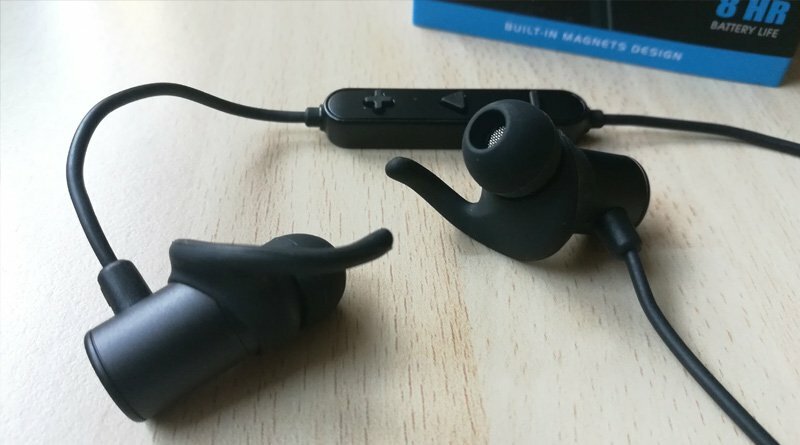 Neat little touches arise whilst in use such as magnets inside each earbud that clip together making sure they won’t rattle around when stored. This is a simple but great addition as clipping them together around your neck while out and about helps to keep them safe when your not using them. Cable clips and various other cable tidies are also provided, as is a neat spring clasped PU Leather case to keep everything together safely whilst on the move. The thoughtful people at SoundPEATS have even thrown in a Micro USB cable to charge the headphones when needed. 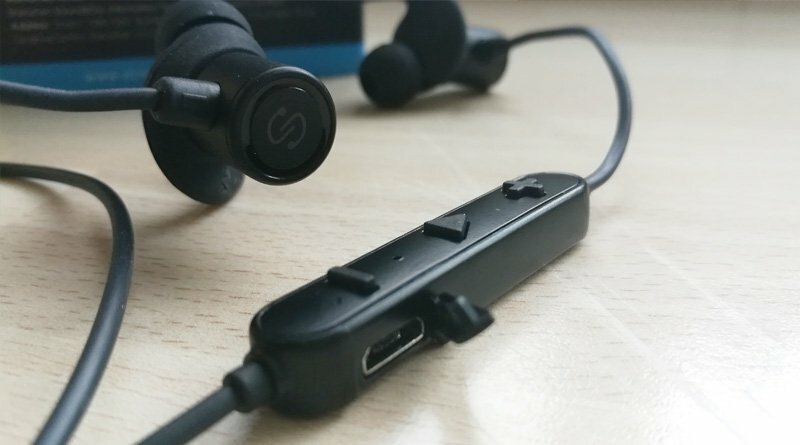 As mentioned, the SoundPEATS Q30’s feature an inline remote control that joins the two earbuds together. Three multifunction buttons on the remote are present that will have different uses whether they are either pressed or held down. Adjusting volume, play/pause, skipping songs and answering/ending calls is all possible. These features will vary depending on the phone you are paired to as the SoundPEATS Q30’s are compatible with both Android and iOS. The Q30’s do have a built-in mic, handy when listening to something on your phone and still want to be able to make or receive calls all without taking your phone out of your pocket. 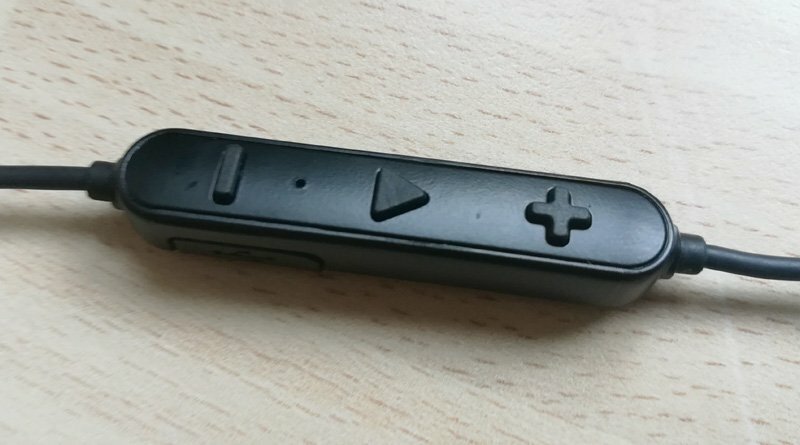 A Micro USB port found on the side of the in-line remote has a rubberised cover that slots in keeping it sweat proof. This port is used to charge the headphones and takes about 1-2 hours to fully charge. An LED indicator is there to alert you of power status whilst charging and will also flash once every 6 seconds when you have a low battery. At some point you’ll notice that voice prompts are here too, vocally alerting you when powered on/off, whether your Bluetooth connection is connected or disconnected and when battery levels are running critically low. These prompts are heard whilst the headphones are being worn and are extremely useful to keep track. Pairing your device with the Q30’s is simple enough. Start by turning on Bluetooth on your phone or tablet, then power on the earphones keeping the multifunction button on the remote pressed until you hear the “power on” voice prompt. Your device will soon discover the Q30 earphones and pairing can continue. Once found you can now pair the two together, at this point you should hear the headset connected prompt and the LED indicator will be a constant blue. Pairing is now complete. Sound quality for many, myself included is important. I’m happy to say there are no worries here with the SoundPEATS Q30’s delivering clear and balanced high-fidelity stereo sound and respectable bass levels with no obvious distortion, thanks to the APTX codec in use. My choice of music features a lot of heavy bass and the Q30’s didn’t fail once so should easily cater for all genres. What’s also great is that you’ll get up to 8 hours usage (depending on the level you have your volume) from one full charge so no complaints there. 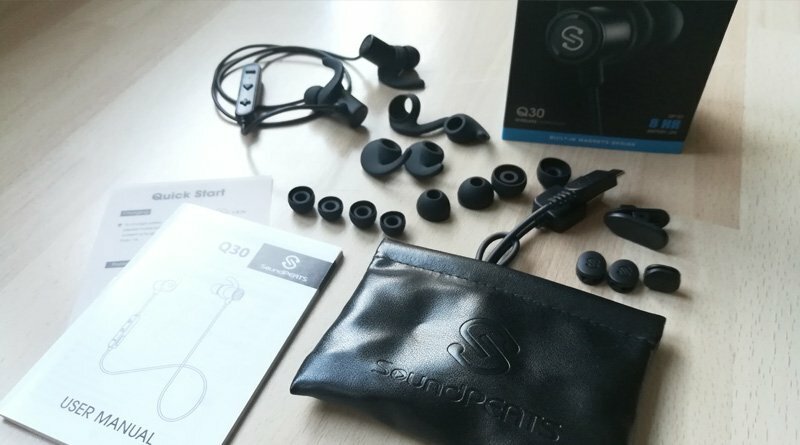 Comfortable, durable, functional what more could you ask for and at a reasonable price the SoundPEATS Q30’s are a great value package for exercise gurus, joggers and casual users alike. Highly recommended. Find The Products You’re looking For? Enjoy the marvellous medicinal and healing properties of hemp oil.